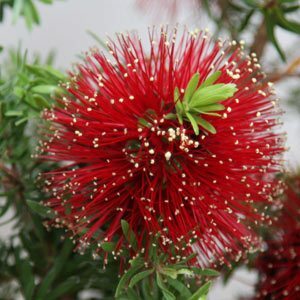 Also known as Muntries or ‘Tick Bush’ Kunzea are a group shrubs with ‘bottlebrush like’ flowers, they are in fact related to Callistemon. With over 40 species in the genus they range from prostrate ground covers to small shrubs. K. pomifera is also known as ‘Muntries’, the berries used as a bush tucker food while the cultivar ‘Badja Carpet’ is an excellent ground cover plant. Used widely in landscaping species such as K. baxteri (pictured right) have attractive foliage and brilliant flowers ranging from red through to pink and creamy white. The variegated form of K. baxteri is known as ‘Cream Haze’, red flowers on a bush that will reach around 2.5m in height, slightly smaller than the species itself. The oil extracted from many species is regarded as one of the most valuable of the essential oils distilled from Australian plants. K.ambigua seems to be of particular interest in this area. Easy to care for, a well drained but humus rich moist soil is best. 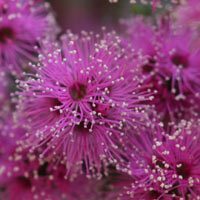 Kunzea are frost tolerant and reasonably drought tolerant once established. K. baxteri or the ‘Scarlet kunzea” with its large bright red flowers differs in form from Kunzea capitata which has smaller pink flowers. Kunzea ambigua is known as the Tick bush and has yellow/cream flowers. K. ericoides like all Kunzea is attractive to birds and will do well along the coast. Hybrid varieties such as K. baxteri x pulchella ‘Red Pendulum’ are increasingly available. The pretty pink K.pauciflora. is underused in our opinion.